Eighteen-year-old Nolan McLeod is the B.C. ambassador for the 2016 Sears National Kids Cancer Ride. When he was 13 years old, Nolan McLeod got the news he had cancer. After finding mysterious bruises on his body and passing out while mowing a neighbour’s lawn, the Tsawwassen teen’s parents took him to the emergency department at BC Children’s Hospital where he was diagnosed with acute lymphoblastic leukemia. McLeod underwent several weeks of chemotherapy and radiation to rid his body of cancer cells and had to miss most of eighth grade. Although there were a lot of challenges to face physically, the toughest part was trying to stay positive. “You have to be positive; that is part of the healing as well,” McLeod said. Three and a half years later, his treatment was finally over and he was able to move on with his life. “I knew when I got out [of the hospital] I wanted to be an advocate for childhood cancer and continue to get the word out and help those kids out who are still in the hospital,” said McLeod. Today, the now-18-year-old McLeod is the B.C. 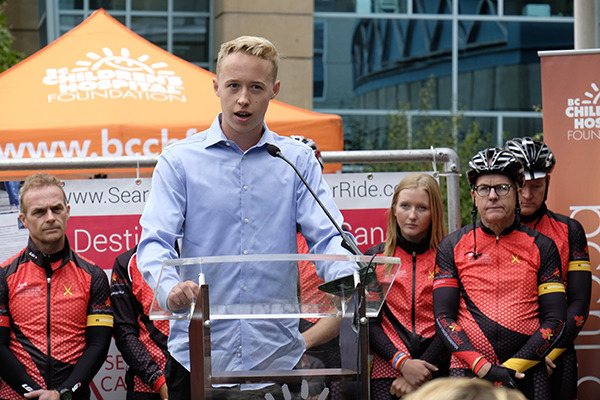 ambassador for the 2016 Sears National Kids Cancer Ride and spoke at the kick-off event at BC Children’s Hospital on Tuesday, Sept. 6. This journey involves 40 cyclists from the Coast to Coast Against Cancer Foundation who will be cycling 7,000 kilometres across Canada to raise money for pediatric oncology programs. The participants start their journey in Vancouver on Sept. 7 and will finish in Halifax 17 days later. Riding in relay style across Canada, the riders will be joined en route by hundreds of others who will cycle shorter “stage-ride” distances in major cities across Canada. Now in its ninth year, the Cancer Ride is one of the biggest charity cycling events for childhood cancer in the world. Cyclists raise funds for not-for-profit organizations that work to improve the quality of life for children living with cancer and their families, while also visiting many of Canada’s 17 pediatric oncology centres and hospitals. “There’s a lot of amazing people like these cyclists raising money for this cause,” McLeod said. One hundred per cent of the funds raised from the event are invested in national initiatives in support of childhood oncology programs as well as local programs in pediatric hospitals and centres around the country. For more information on the ride or how to donate, visit searsnationalkidscancerride.com.